IMPORTANT NOTE TO GPS AND MAPQUEST USERS: If you enter our address into either one of those programs, please enter it as "1845 Shelby Street, Indianapolis, IN 46203." Do NOT enter it as "South" Shelby Street. There is a glitch in both of those programs that will take you over a mile farther south of our store, down to the area of Troy Avenue and Shelby Street, which is the 3000 South block of Shelby Street. There is NO North Shelby Street in Indianapolis, so entering it WITHOUT the "South" will get you here! One story concrete block building on the EAST side of Shelby Street, between Weilhammer Plumbing & United Sign Company. It’s the NORTHEAST corner of Shelby & Naomi Streets. 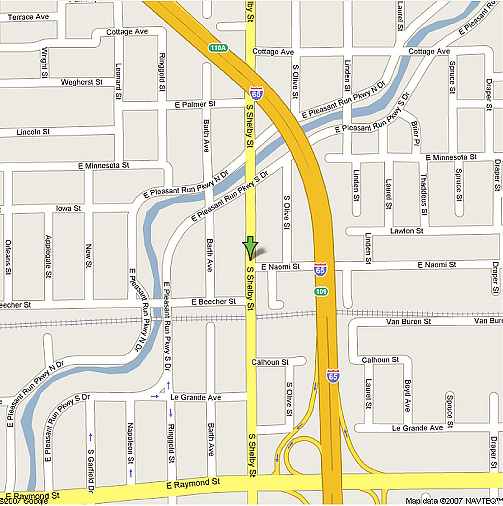 We’re about one block SOUTH of Pleasant Run Parkway, & about 4 blocks NORTH of Raymond Street. We’re just NORTH of the Railroad overpass, where the road makes a really low dip & then comes back uphill. It's still considered part of Fountain Square, & we're about 3/4 mile SOUTH of the fountain. We're also about ½ mile SOUTH of the IMPD Southeast District building. We have our own parking lot, so you don’t need to look for a meter or pay for parking. Take I-65 SOUTH to the Raymond Street exit. Turn RIGHT / WEST on Raymond at the end of the exit ramp. The first stoplight is Shelby Street. There is a CVS on the left & a White Castle on the right side. Turn RIGHT to go NORTH on Shelby. Go about 1/3 mile (approximately 4 blocks) to Naomi Street. Look for us on the RIGHT side of the street. Take I-70 WEST to I-65 SOUTH to the Raymond Street exit. Turn RIGHT / WEST on Raymond at the end of the exit ramp. The first stoplight is Shelby Street. There is a CVS on the left & a White Castle on the right side. Turn RIGHT to go NORTH on Shelby. Go about 1/3 mile (approximately 4 blocks) to Naomi Street. Look for us on the RIGHT side of the street. Take I-65 NORTH to the Raymond Street exit. Turn LEFT / WEST on Raymond at the end of the exit ramp. The second stoplight is Shelby Street. There is a CVS on the left & a White Castle on the right side. Turn RIGHT to go NORTH on Shelby. Go about 1/3 mile (approximately 4 blocks) to Naomi Street. Look for us on the RIGHT side of the street. OR Take Madison Avenue NORTH to Shelby Street and turn RIGHT at a 45 degree angle onto Shelby. Keep going NORTH on Shelby until you pass Raymond Street. There is a CVS & a White Castle on the right side. Go about 1/3 mile (approximately 4 blocks) farther to Naomi Street. Look for us on the RIGHT side of the street. OR Take Madison Avenue NORTH to Pleasant Run Parkway North Drive. It is a stoplight with an IPS school and a Phillips 66 gas station on the right side. Watch for the slower speed limit in the school zone. Turn RIGHT to go EAST on Pleasant Run. Follow Pleasant Run as it curves around until you get to Raymond Street. Turn RIGHT / EAST on Raymond. Go a short distance to Shelby Street. There will be a stoplight there with a CVS and a White Castle on the corners. Turn LEFT to go NORTH on Shelby. Go about 1/3 mile (approximately 4 blocks) to Naomi Street. Look for us on the RIGHT side of the street. *** NOTE: You can NOT turn onto Raymond Street directly from Madison Avenue. Raymond is an overpass at that intersection. OR Take Hwy 135 (Meridian Street) NORTH to Pleasant Run Parkway North Drive. Before you turn, you will be able to see the downtown skyline, and you will pass a large cemetery on the right side and then pass Barringer’s Bar. Do NOT take Pleasant Run Parkway South Drive, as it does NOT go all the way through. There will be a stoplight when you get to Pleasant Run Parkway North Drive, and another large cemetery on the left side. Turn RIGHT to go EAST onto Pleasant Run North Drive. Go PAST Madison Avenue (another stoplight with an IPS school and a Phillips 66 gas station on the corners). Watch for the slower speed limit in the school zone. Follow Pleasant Run as it curves around until you get to Raymond Street. Turn RIGHT / EAST on Raymond. Go a short distance to Shelby Street. There will be a stoplight there with a CVS and a White Castle on the corners. Turn LEFT to go NORTH on Shelby. Go about 1/3 mile (approximately 4 blocks) to Naomi Street. Look for us on the RIGHT side of the street. Take I-70 EAST to I-65 SOUTH to the Raymond Street exit. Turn RIGHT / WEST on Raymond at the end of the exit ramp. The first stoplight is Shelby Street. There is a CVS on the left & a White Castle on the right side. Turn RIGHT to go NORTH on Shelby. Go about 1/3 mile (approximately 4 blocks) to Naomi Street. Look for us on the RIGHT side of the street.